The Conference discussed and recommended measures to promote human rights and welfare of children and women. At the invitation of the Government of Pakistan, Secretary General of SAARC delivered remarks at the Inaugural Session of the Conference. An event of South Asia Initiative to End Violence against Children (SAIEVAC), an apex body of SAARC, held parallel with the 1st International Human Rights Conference to review and refine the daft Regional Strategy on Child Sexual Abuse and Exploitation including online safety (CSAE&OS). 36 participants including SAIEVAC focal points & representatives from SAARC Member States and NGOs. The Meeting was organized by SAARC Secretariat in collaboration with SAARC Agriculture Centre (SAC), Dhaka, World Organization of Animal Health (OIE) and Food and Agricultural Organization of the United Nations (FAO). The Meeting reviewed the progress made since its First Meeting in April 2016, set new targets and strategies to control the disease and free the region from PPR by 2028, the year the SAARC Chief Veterinary Officers’ (CVOs) Forum also agreed upon in May 2017 to free the region from PPR. The Meeting discussed the incremental need of resources, multilateral funding and specialized funding for NCDs (including Mental Health) and Indoor Air Pollution as the tenth monitorable target in the NCD Monitoring Framework. The Meeting also considered draft Terms of Reference (ToR) for its future meetings. Sixth SDOMD:The Meeting recommended measures to prevent/combat drug offences in the region. Sixth STOMD:The Meeting considered the matter pertaining to the Secure Database of SDOMD and STOMD to strengthen these mechanisms. Eleventh Police Conference: The Conference considered the concept papers on SAARCPOL and SAARC Institute of Criminology, and matters relating to networking among the Police Authorities and combating corruption, among others. The Meeting discussed matters relating to enhancing cooperation among the Member States in statistics focusing on Gender. This was a follow-up meeting to the South Asian Parliamentarians’ Platform held in 2017, organized by UNICEF. The Finance Ministers/Heads of Delegation briefed the Meeting about the economic progress achieved in their countries, appreciated the cooperation from the Asian Development Bank (ADB) in economic growth and expected that SAARC would make further progress to achieve its full potential for the benefit of peoples of the region. The Meeting was held on the sidelines of the Fifty-first Annual Meeting of ADB. In collaboration with UNICEF and for the second year, this meeting was held. Secretary General of SAARC was the Chief Guest at the Inaugural Session. Director (SA) moderated the keynote panel, and also delivered remarks at the closing session. The meeting called for regional action through SAARC to address the issue. 120 Participants from SAARC Member States, UNICEF ROSA and HQ Officials, NGOs. Attended by 4-8 member delegations from all SAARC Member States. SAARC-PTB Workshop was organized under the Memorandum of Understanding (MoU) in 2003 with the objective to implement technical cooperation projects in the area of metrology, standards, testing, quality management, accreditation and certification, collectively known as MSTQ, in the Member States of SAARC. The Cooperation Agreement focuses on the development, protection and participation of children, and raising awareness, understanding and action for children, through formulating frameworks, policies and programmes, and various other initiatives. SAARC and UNICEF ROSA work together on issues related to children, specifically focusing on education, early childhood development, maternal and adolescent nutrition, as well as on issues relating to child marriage, development of children and youth, gender equality, violence against children and health issues in South Asia. The Meeting discussed Strategies to improve Agricultural and Rural Statistics (GSARS) to meet emerging data requirements, and address the needs to monitor cross-cutting development issues. During the Meeting, SAARC requested support for Member States on agricultural statistics as was discussed with the FAO Regional Office in 2017. The two-day Symposium was organized by Nepal Rastra Bank under the auspices of SAARCFINANCE with the theme, “Developing a Common Platform for Strengthening Digital Payment System in the SAARC Region”. The meeting discussed measures to streamline the SAARC Visa Exemption Scheme, including development of its security software for implementation across the region. The meeting considered the Secretariat’s Budget of 2018. The Global Framework for the Progressive Control of Transboundary Animal Diseases (GF-TADs) is a joint FAO/OIE initiative that combines the strengths of both organisations in translating the GF-TADs objectives on the ground. The mechanism promotes collective action to support the control and eradication of transboundary animal diseases and has yielded several important institutional and operational gains. Members of the RSC use these meetings to share information and strengthen partnerships in the prevention and control of priority TADs. The 10th RSC discussed the previous activities and achievements under GF-TADs and made recommendations on the way forward for GF-TADs in the region. Chief Veterinary Officers/ Veterinary Officers/ Livestock Specialists of the Asia Pacific Region and the Experts of FAO and OIE. The SAARC Secretariat, with collaboration of the UNICEF ROSA and UNESCO Regional Office in Bangkok, organized Technical Meeting of Senior Officials of Education in Bangkok on 11 July 2018 to consider the SAARC Action Plan to implement New Delhi Declaration on Education and the SAARC Framework for Action: Education 2030. Food and Agriculture Organization of the United Nations (FAO), in collaboration with the Asian Farmers’ Association for Sustainable Rural Development (AFA), organized the programme with the facilitation of the SAARC Secretariat and SAC. The aim of the Forum was to recognise the potential of cooperatives in achieving inclusive, broad-based and sustainable economic growth and development. The Forum called for sharing of experience, expertise and best practices in this sector. This Forum, which brought together representatives of the Government, farms, NGOs and cooperatives shared experiences and made recommendations to strengthen family farmers’ agricultural cooperatives toward promoting sustainable incomes, livelihood and rural development. The participants deliberated on the status of regional cooperation in South Asia vis-à-vis the ‘New Southern Policy’ of ROK. They also discussed possible collaboration between SAARC and ROK. Director (IPA) attended as a panelist. Organized by the Government of Nepal in association with International Society of Extension Education (INSEE). Inaugural session was attended by the Right Hon’ble Prime Minister of Nepal, and State Minister for Agriculture & Livestock Development of Nepal and SG. Representatives of several Member States attended. The participants discussed the way forward for MFF. New York (on the sidelines of UNGA). The Heart of Asia-Istanbul Process was established to provide a platform to provide security, political, and economic cooperation among Afghanistan and its neighbours. This process was launched in November 2011 to expand practical coordination between Afghanistan and its neighbours and regional partners in addressing common threats, including terrorism, narcotics, poverty and extremism. The United States and over 20 other nations and organizations serve as "supporting nations" to the Process. H.E. Salahuddin Rabbani, Minister for Foreign Affairs of Afghanistan; H.E. Araz Azimov, Deputy Foreign Minister of Azerbaijan; the UN Secretary-General’s Special Representative for Afghanistan; Representatives of participating and Supporting Countries and Director (HRT) from SAARC Secretariat. Earlier meetings of SLDF and EpiNet Forum were organized under the HPEDs (Highly Pathogenic and Emerging Diseases) project and later under TADs (Food Security through Control of Transboundary Animal Diseases) Project. On completion of the project in July 2017, due to absence of any Project/Fund, these meetings were not included in the SAARC Calendar of Activities of 2018. However, later these two meetings were organized in October 2018 with the support of FAO-RAP. Representatives from the Member States of SAARC. The event was jointly organized by UNESCAP and the NITI Aayog, Government of India. The Forum discussed, inter alia, key challenges and opportunities for implementation of the 2030 Development Agenda, mechanisms to garner regional coordination and support for the integrated implementation of the agenda in South Asia and regional/sub-regional cooperation and coordination to support and complement the efforts of national mechanisms for achieving SDGs in South Asia. Director (IPA) attended the Forum as a panelist. The Governing Board reviewed the programmes/activities of 2018; and approved programmes/activities and Budget of SAC for 2019. Governing Board Members of SAC, Director (ARD) and Director (SAC) attended. The meeting was attended by all Member States. The meeting considered the draft road map for implementation of SAARC Framework Agreement on Energy Cooperation (Electricity). Ministry of Labour, Employment and Social Security, Government of Nepal, hosted the meetings as the Chair of the Colombo Process. Director (IPA) attended both the meetings as an observer. Jointly organized by Regional Office of the Global Strategy to Improve Agricultural and Rural Statistics, Food and Agriculture Organization of the United Nations (FAO) and SAARC Secretariat. The training provided details of the guidelines on Master Sampling Frames (MSFs) for Agricultural Statistics to facilitate transfer of knowledge to the personnel involved in the construction, use and maintenance of MSFs and to meet current and emerging data requirement for making evidence based policies. Participants from all Member States attended the training. Inaugural Session was attended by Director (ARD), Director (ENB ) and DO (ARD). The Seventh GB Meeting was held under the Chairpersonship of Smt. Surina Ranjan, Director-General, Bureau of Indian Standards (BIS), New Delhi, India. 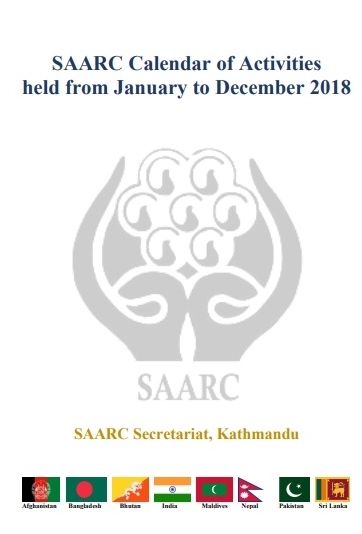 The Meeting considered the budget of SARSO for the year 2019; endorsed the Report of Sixth Meeting of TMB of SARSO; approved the guidelines for adoption and implementation of SAARC Standards; considered the Report of the Regional Kick-off Workshop of the project; and considered the SARSO Calendar for 2019 and matters pertaining to Election of the Chairperson of GB of SARSO for a tenure of two years (02 March 2019 to 01 March 2021). Academic Field Trip by Graduate Students from Johns Hopkins University, School of Advanced International Studies (SAIS), Washington D.C. The graduates were briefed about the SAARC process and its various mechanisms by Director (IPA). The briefing was followed by question and answer session. The Associate Director and students were grateful and appreciative of the informative and enriching briefing about the SAARC process. Co-hosted by the Afghan Government and the United Nations. The goal of the Conference was to show the solidarity of the international community with the Afghan people and the government in their efforts for peace and prosperity; and for the Afghan Government to renew its commitment to development and reform. This was a crucial moment for the Afghan Government and international community to demonstrate progress and commitment, and maintain the momentum for sustained collaboration. SG met and interacted with the students. The students were also briefed about the activities and functioning of the Secretariat. The students were very curious and excited to get the knowledge about SAARC and functioning of the Secretariat. The Secretariat welcomes educational trips from educational institutions of the Member States and provides visiting students with an opportunity to interact and learn about SAARC. A chapter on SAARC is part of the Social Studies curriculum for classes six and seven of Nepali schools. Sharing of knowledge and experience for utilization of space based and geospatial information for achieving the targets of the Sendai Framework. A Panel Discussion on Disaster Management in South Asia was also organized to observe the Thirty-fourth SAARC Charter Day. SG hosted a Reception to commemorate the Thirty-fourth SAARC Charter Day (08/12/2018). was the Chief Guest of the occasion. Dignitaries and officials from the Govt. of Nepal, leaders of political parties, resident Ambassadors, heads of regional and international organizations, representatives from civil society and business community, as well as professionals from various fields attended the function. The Meeting discussed administrative and financial issues of the SAARC Regional Centers and Specialized Bodies. The Meeting considered the Secretariat’s Budget for 2019. The Board Project Appraisal Committee appraised the projects under the three funding windows and recommended to SDF Board for approval. The GB Meeting approved the Budget and the Calendar of Activities of SARSO for the year 2018. The GB also formed a Selection Committee for the appointment of DG SARSO. FAC recommended SDF Secretariat’s budget for approval of the Board and also took decisions on other financial and administrative issues related to SDF. The Board, in principle, approved two projects under the Infrastructure Window. The Board also approved the SDF Secretariat’s budget for 2018 as per the recommendation of FAC. During the Third Convocation, the University awarded 160 students with Masters, 10 with M.Phil. and 06 with PhD degrees. A discussion on different library services and using online resources by the Assistant Librarian. Workshop on "Importance of SARCO as a Regional Arbitration Centre for Development of Trade & Investment & the Context of Arbitration in Sri Lanka"
The Regional Workshop was held in Colombo with partners in Sri Lanka. The Sri Lanka National Arbitration Center (SLNAC) and trading community (FCCISL) have been engaged to address important arbitral issues in Sri Lanka. The Workshop was organized to assist SLNAC by holding a collaborative event in Colombo. FCCISL provided the necessary highlight within the traders of Sri Lanka. The keynote speech was delivered by Professor Emmanuel Brunet-Jailly, Professor of Public Policy at the University of Victoria, Canada. He highlighted the importance of continuing research on borders under globalization, as well as the issue of connectivity in South Asia. There were 12 sessions for presentation of research papers. The Internal Auditor of SDF conducted field Internal Audit for 13 projects. In order to get an independent review of SDF funded projects, M&E Office arranged field visits to SDF funded projects. Six projects and three countries were selected as the sites of the field visits. The overall impression gleaned from field visits is that the SDF support has helped communities, particularly women to improve their livelihood. The involvement of the SDF in helping the people and the Member states to eradicate poverty and to contribute to human development was regarded as highly valuable by all stakeholders in project countries. Bearing in mind the complexity and challenges faced at the implementation level, the programs implemented by the SDF can be considered successful. Project implementation status and progress made by implementing agencies (IAs), were noted. ii. Solicit Cross-Border Project co-financing under the Economic & Infrastructure Windows of SDF in Member States; and iii. Build partnerships with various organizations for Fund Mobilization and Investments in Member States. Three speakers from the USAF Air War College participated: Professor David S. Sorenson and Dr. Amit Gupta from the Department of International Security Studies; and Professor Xiaoming Zhang from the Department of Strategy. Chaired by Dr. Kavita Sharma, President, SAU. Round-table discussion on "Law and Liberal Democracy"
Chaired by Professor Sanjay Chaturvedi, Dean, Faculty of Social Sciences, SAU. Panelists included Professor Neera Chandhoke, a renowned political scientist and former Professor of Political Science, Delhi University; Dr. Anup Surenedranath of the National Law University Delhi; Dr. Prabhash Ranjan; and Dr. Soumita Basu of the SAU. The Workshop sought to examine the research and initiatives being taken by the two institutions, and identify areas of collaboration and interaction. Special lecture by Professor Prabhat Patnaik and Professor Emeritus, Jawaharlal Nehru University, on the theme "Imperialism, Third World and Unequal Development: Reflections on the Life and Works of Samir Amin"
Professor Patnaik highlighted the centrality of imperialism in Samir Amin's work, and elaborated on how Amin integrated the idea of imperialism within the Marxian labour theory of value through his work on unequal exchange. Mr. Shivshankar Menon, India’s former National Security Advisor and Foreign Secretary, delivered the Lecture. The event was chaired by Dr. Kavita A. Sharma, President of SAU. The objective was to strengthen the National Sickle Cell Disease Control within the framework of Nepal National Program for the Prevention and Control of Non-Communicable Diseases, and also to spread awareness on screening, management and prevention of hemoglobinopathies. An instructor from the Cambridge University presented a live demonstration on the Cambridge Core Platform, current subscription package of SAU, how to use the new platform, faceted search functionalities, downloads, etc. Independent Evaluation of SDF funded projects (a) Strengthening the livelihood initiative for home-based workers in SAARC Region (SABAH) (Phase 2); (b) Post-Harvest Management and Value addition of Fruits in Production catchments in SAARC Countries; and (c) Strengthening of Water, Sanitation and Hygiene (WASH) Services in selected areas of SAARC countries, was conducted through third party (KPMG) with an overall objective to assess the relevance, impact, sustainability, effectiveness, efficiency and sustainability of the projects in accordance with the United Nations Evaluation Group (UNEG) Evaluation Norms as well as OECD-DAC evaluation principles and guidelines. Awareness programme with the Embassies/High Commissions of SAARC Member States in Dhaka, Bangladesh. Representatives of the Embassies/ High Commissions of SAARC Member States in Dhaka, Bangladesh, Ministry of Foreign Affairs, Bangladesh and Bangladesh Standards and Testing Institution (BSTI) participated. The Meeting was held under the Chairpersonship of Mr. Anil Jauhri, Chief Executive Officer of National Accreditation Board for Certification Bodies, India. Eight SDF officials benefited from the training and gained a broader understanding of Project Financing. SDF Officials attended the training. Progress of 2018 was reviewed and Governing Board expressed its satisfaction. Guidelines for 2018 and recommendations for the Programming Committee meeting were formulated. SARCO Seminar on "Arbitration: An Effective Dispute Settlement Tool; Regional Experience and implications for Maldives"
Regional Seminar was held in Maldives with local partners. The office of Attorney General for Maldives and trading community, SCWEC (Maldives), have been engaged to promote institutional arbitration in Maldives. Collaboration from the Attorney General Office was sought to promote reliance on Alternate Dispute Resolution by the governmental and trading quarters of Maldives. Mustafiz and Dr. Ritu Gaur. The book was edited by three members of the Department of Sociology, Dr. Ravi Kumar, Dr. Dev Nath Pathak and Prof. Sasanka Perera and published by Orient Blackswan. The Faculty of Economic Sciences and Business Administration, Transylvania University of Brasov, Romania, provided collaborative support for the Symposium. The Faculty of Economics, SAU and the Department of Statistics and Economics, University of Peradeniya, Sri Lanka. The Panel consisted of Professor Nandini Sundar, Delhi University; Professor Archana Prasad, Jawaharlal Nehru University; Professor Ramdas Rupavath, Hyderabad University; and Kotesh Devulapally, Independent Researcher. Dr. Ravi Kumar, Department of Sociology of the SAU, chaired the lecture. The Authors' Workshop discussed issues such as the role of culture, community, gender and critical communication in hydro-diplomacy. CEO SDF attended Expert Group Meeting on Investment Needs for Achieving the Sustainable Development Goals in Asia and the Pacific. The two-day Expert Group Meeting brought together experts from the UN and other international organizations as well as leading think-tanks and universities in the Asia-Pacific region, with a view to developing a comprehensive assessment of investment requirements for achieving the SDGs by 2030. CEO SDF delivered a presentation on investment needs in economic and infrastructure sectors of South Asia. The objective of the panel discussions was to explore the intersecting boundaries of populism, nationalism and extremism, both theoretically and empirically, using feminist methodologies. The resource person for the Workshop was Prof. Gunhild Hoogensen Gjorv, The Arctic University of Norway. The Workshop was chaired by Prof. Sanjay Chaturvedi, Dean and Chairperson, Department of International Relations, Faculty of Social Sciences, SAU. International Relations, Faculty of Social Sciences, SAU. SDF officials participated in the 3-day Training, which imparted hands-on practical exposure on analysis of financial statements, management accounting for decision making, investment appraisal and simulation. International Workshop on the measurement of efficiency and productivity using data envelopment analysis (DEA). The three-day classroom-based Workshop was attended by more than 50 participants from India. It was conducted by Dr. Sunil Kumar, Associate Professor, Faculty of Economics, SAU, along with Dr. Charles Vincent, Professor of Management Science and Director of Research, Buckingham Business School, the University of Buckingham, UK. Project Inception Meeting was held for the Implementing Agencies and Coordinating Agency for the project “Livelihood Enhancement of the small farmers in SAARC Region through small scale agro business focusing on value chain”. 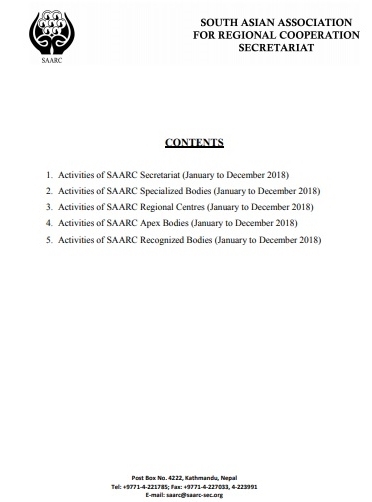 In this project of SAARC Member States, SAC is the Coordinating Agency (CA). The project was approved by the SDF Board during the 28th Board Meeting. Representatives of the Member States of SAARC, and officials of SAC and SDF attended. The Committee concluded with recommendations to the Board for final approval of three projects under the E&I Windows and two projects under the Social Window. Members of the Project Appraisal Committee of SDF Board of Directors. Eight SDF officials benefited from the training and gained a broader understanding of Project Appraisal. The SEGA noted the latest updates and developments of the Accreditation/NAFP activities in the Member States, agreed on the objectives of SEGA, and recommended to hold its annual Meeting in the month of August every year in the Member States in alphabetical order. It also prioritized recommended activities under SEGA. Foreign Secretary to Government of Pakistan was the Chief Guest. Ambassadors and representatives of all SAARC Member Countries and Observers attended the ceremony. of an entertainment channel, which include Prof. BK Dass, Prof. Sat Gupta, Dr. Haneet Gandhi, Dr. Shankar Kumar, Dr. Chandrima Majumdar and Mr. Akul Tripathi. To commemorate the 34th SAARC Charter Day, SDF hosted a program, reiterating their unwavering support and commitment to the SAARC process. The event brought together Ministers, high-ranking government officials, heads of international organizations, and civil society representatives. H.E. Mr. Lyonpo Namgay Tshering, Finance Minister, Royal Government of Bhutan and Member of the SDF Governing Council graced the occasion. SARSO and SAARC Agriculture Centre (SAC) jointly organized the event. The senior officials of the Ministry of Foreign Affairs, Bangladesh; stakeholders of SAC and SARSO in Bangladesh and staff of both the organizations participated in the event. Presentations were delivered by both the organizations. The Committee concluded with recommendations to the Board for final approval of three projects under the E&I Windows & two projects under the Social Window. Members of Project Appraisal Committee of SDF Board & SDF officials. The Committee considered draft anti-harassment policy and salary issues for SDF Secretariat. Members of Human Resource Committee of SDF Board & SDF officials. SDF budget for FY 2019 was recommended to the Board for approval. Members of Finance & Audit Committee of SDF Board & SDF officials. The 30th Meeting of SDF Board of Directors approved three projects under the Economic and Infrastructure Windows of SDF. It also approved the activities/ programmes and Budget of SDF for 2019. SDF Board of Directors, Director (ARD) and CEO of SDF attended. The meeting discussed various issues regarding the existing projects and forthcoming projects. SDF officials were trained on available MIS technologies and the effective management of grant and loan through MIS, including collection, assimilation, aggregation, calculation, and analysis of data, and generating customized reports. Articles were reviewed by external reviewers for 1st issue of Journal. SAARC HIV/AIDS and Tuberculosis Centre. The Document has been prepared and circulated electronically. Training Programme on “Mainstreaming Disaster Management in Infrastructure Sector"
Sharing of knowledge and experience for integrating risk reduction in infrastructure sector. Organized by the Interim Unit of the SAARC Disaster Management Centre (SDMC). The Director and Training Officer conducted the monitoring of NTP and NACP in Maldives on 22-24 January 2018. Award recipient – Mr. Najibulla Manalai of Afghanistan. Through the Webinar, national and international experts shared their experiences regarding technical, design, installation, modeling, financial, policy, market management and business development aspects of the hydrokinetic turbines. Workshop on “Emergency Services Reform and SAARC Rescue Challenge"
Improve coordination and ensure uniform standards of emergency services in the Member States of SAARC with the aim to help capacity building and skill enhancement in emergency services. Document prepared and circulated electronically. Dissemination Webinar on "Study to Investigate the Difficulties for Household Solar Systems in SAARC Region". The Webinar presented the difficulties, problems and social issues faced by the Solar Home Systems programmes in South Asia & suggested solutions and recommendations for effective implementation of Solar PV technology in off-grid electricity supply. Theme of the Programme was “A Mother’s Song: An aesthetic journey through South Asia in search of the Rhythms of Love”. Development of action plan and capacity building for heat preparedness. Made recommendations on Management of TB Control Programme in Urban/Slums in the SAARC Member States. Interaction Programme conducted on 22 March and Joint Programme conducted on 24 March 2018. Exchange of experiences and technologies among the SAARC Member States. Develop concept/proposal to up-scale the successful technologies in SAARC Member States. Member States of SAARC and SAC experts attended. Testing SSM for NRLs of the Member States of SAARC was conducted successfully. SAC presented seven project proposals for consideration of the development partners. IFAD agreed to develop a US $ 3.5 million regional grant project on Consortium for Scaling-Up Climate Smart Agriculture in South Asia and several other development partners also expressed their willingness to participate in some of the projects presented by SAC during the Meeting. Representatives of all the Member States, along with FAO, ADB, WB, Winrock, IFAD, JICA, SDC, IFPRI, IRRI & CCAFS. SG & Director (ARD) & SAC experts. Recommended SAC to formulate SAARC-GAP in collaboration with FAO-RAP. Member States of SAARC & SAC expert. Dissemination Webinar on “Study for Deployment of Electric Road Transportation in South Asia". The Webinar presented an overall view of Electric Road Transportation initiatives in South Asia, and the Challenges & Opportunities in deploying Electric Road Transportation in SAARC Region. The Centre has digitalized the Library resources to facilitate online access to the readers. The upgraded library and video conferencing facility at STAC was inaugurated by the SG of SAARC. Comprehensive animal breeding policies and strategies have been proposed for the Member States. Existing animal breeding policies and strategies have been included in the Report for mutual benefit. Member States of SAARC and SAC expert. The consultation came up with a couple of key recommendations such as establishment of Working Group and piloting of CSA technologies among member countries through a bigger project. Participants acquired knowledge/skill on diagnosis and treatment of Pediatric TB. Workshop on “Disaster Risk Reduction (DRR) in SAARC Region"
1. To take stock of DRR Initiatives taken up by the Member States and share the best practices amongst each other. 2. Understand the needs of the Member States to be addressed in the coming years by the SDMC (IU). 3. Develop some kind of monitoring mechanism for implementation of the Sendai Framework for Disaster Risk Reduction in the Member States. Member States, ADB, Director, BIMSTEC, Director (ENB) & DO (ENB) & NIDM. Organized by SDMC Interim Unit. The Training addressed the issue of outbreak of emerging and zoonotic livestock diseases. It also considered measures to eradicate economically important livestock diseases. The objective of the Webinar was to disseminate the findings and recommendations of the study report (conducted by SEC in 2017) among the stakeholders for adding value and making consensus of the terms of reference for updating the existing feasibility study. Knowledge Sharing Workshop on “Modern Techniques Including Renewable Energy Auctions for Economizing Renewable Energy Tariff”. Participants of the Workshop discussed the importance of renewable energy, shared their experiences and committed themselves to work for optimal utilization of renewable energy resources for South Asia. The Training imparted knowledge on new innovative techniques and technologies on animal feed and nutrient analysis as well as on cost effective and quality feed formulation. i) Draft Revised SAARC Regional Strategy on ACSM (2018-2023). ii) Draft Revised SAARC Regional Strategy on HIV/AIDS (2018-2023). iii)Draft Revised SAARC Regional Strategy on Elimination of Tuberculosis (2018-2023). iv) Draft SAARC Regional Strategy on Migrant Health/Cross border issues in the SAARC Member States (2018-2023). v) Draft Revised Vision Document of STAC. Participants recommended formulation of multi-country project on community seed development. Films from Bangladesh, Bhutan, India, Maldives, Pakistan and Sri Lanka were screened with participants from Bangladesh, India, Maldives and Sri Lanka. The Training was attended by all the Member States except Afghanistan. The trainees were provided hands-on training on mass rearing bio-control agents, their release in laboratories and usage, monitoring and evaluation in fields, IPM technologies and bio-pesticides. The second PhD Scholarship has been awarded to Ms. Sara Shahibzada of Afghanistan. The Second SAARC Cultural Capital programme was conducted in Thimphu, Bhutan, on 31 May 2018. The objective of the SAARC Cultural Capital programme is to promote cultural values of the selected ancient cities of the Member States of SAARC. Bangladesh, Bhutan, India, Maldives, Nepal and Sri Lanka sent nominations for the programme. However, participants from India and Maldives were unable to join. University of Sri Jayewardenepura, Nugegoda, Sri Lanka. Training on Energy Statistics and Publishing of National Energy Data. It was a two-day hands-on practice over a specially made software for compilation of national energy data. Trainees also printed a sample National Energy Data Book, using the software. 20 participants successfully completed the training. Mr. Thoriq Ibrahim, Minister for Environment & Energy, Maldives, was the chief guest of the inaugural session. The software tool was handed over to the participants (free of cost) for their use and further training to others. A comprehensive book on the country status report will be published. Jointly organized by SAC and International Rice Research Institute (IRRI). A comprehensive report on the said training has been published. Skill development of GSS by attending field related Trainings/ Workshops/Conference, etc. It was a two-day hands-on practice over a specially made software for compilation of national energy data. 37 participants successfully completed the training. Engineer Mohammad Gui Khulmi, Acting Minister for Energy & Water was the chief guest in the inaugural session of the training. This Art competition received over 500 entries from schools across Sri Lanka. Five Member States participated in the event where 44 research papers were presented. SCC and Indira Gandhi National Centre for the Arts, New Delhi, India. Imparted training on the best practices and lessons learnt in and around the Member States to reduce the vulnerabilities during disasters and hands-on emergency preparedness and responses for disasters. The Meeting approved the budget and tentative programmes for 2019. The Council of Experts, sponsored by ADB, is a spearhead body to advance cross-border trade of power between SAARC Member States. Attended by Research Fellow (Power), Mr. Bilal Hussain of SEC. This Workshop helped enhance disaster risk understanding in the participating countries and states. Participants learnt about the benefits of systematically collecting disaster information and reinforcing capacities to develop and maintain disaster loss databases (DLD); and report on Sendai targets. The Project Inception Meeting was held for the Implementing Agencies and Coordinating Agency for the project “Livelihood Enhancement of the small farmers in SAARC Region through small scale agro business focusing on value chain”. In this project of SAARC Member States, SAC is the Coordinating Agency (CA). The project was approved by the SDF Board during the 28th Board Meeting. Meeting with the heads of laboratories. · Awareness event dedicated for enhancing women participation in the field of space technology and associated fields of disaster management. The themes of the 2018 Artists Camp were "South Asian Splendour” and "Vibrant Tranquillity”. The event included a presentation on the role and activities of SCC over the past eight years, and a performance by the State dance troupe. Secretary to the Ministry of Culture attended as Chief Guest of the event. To commemorate the 34th SAARC Charter Day, SAC and SARSO jointly organized the programme, attended by around 200 participants. The Thirty-fourth Charter Day was commemorated in collaboration with MoFA, Pakistan, and SAARC Arbitration Council and SAARC Chamber of Commerce and Industries. H.E. Ms. Tehmina Janjua, Foreign Secretary of Pakistan, was the Guest of Honor. Ambassadors, diplomats, dignitaries & officials of SAARC countries & other regional organizations attended the function. The event included discussions and technical presentations by experts in the field of traditional dance. SCC, in collaboration with the Ministry of Culture, Tourism and Civil Aviation, Nepal. Data collection of one site is on-going. Study on "Mobilizing International and Regional Finances/Funding for Implementation of Renewable Energy Projects in the Member States"
The Study has been carried out by international research house, M/S Pricewaterhouse Coopers Private Limited, India, which was selected after competitive bidding process. The Study deliberates upon various much needed funding options for renewable energy projects, which are crucial for increasing energy access/availability in the SAARC region. In 2019, the contents of the Study shall be shared/ disseminated with relevant professionals and stakeholders, to have their inputs incorporated in the final draft. Thereafter, it shall be made available, free of cost, through SEC website and SAARC Secretariat official documents portal. Study on "Roadmap for Implementation of Smart Grid: Concepts, Practices and Technologies in SAARC Region"
The Study discusses how smart grid technology can be introduced in the SAARC countries, and elaborates its usefulness to power sector of the SAARC countries as well as benefits to the people of SAARC. In 2019, the contents of the Study shall be shared/ disseminated with relevant professionals and stakeholders, to have their inputs incorporated in the final draft. Thereafter, it shall be made available free of cost through SEC website and SAARC Secretariat official documents portal. Study on "SAARC Energy Outlook 2030"
The Study has been carried out by international research house, M/S CRISIL of India, which was selected after competitive bidding process. The Study examines energy requirements of each SAARC nation and thoroughly analyzes the underlying demand drivers and corresponding supplies available to match the demand. Study on "Infrastructure and Enabling Environment for Road Electric Transport in SAARC Member States"
The Study has been carried out by international research firm M/S India Smart Grid Forum, India, which was selected after competitive bidding process. The Study deliberates upon various infrastructure and other requirements needed by each SAARC Member State for smooth transition to the electric transportation. In 2019, the contents of the Study shall be shared/ disseminated with relevant professionals and stakeholders to have their inputs incorporated in the final draft. Thereafter, it shall be made available free of cost through SEC website and SAARC Secretariat official documents portal. Study on "Promotion of Trans-Border Business of Crude Oil and Petroleum Products in SAARC Region"
The Study discusses the country-wise business of petroleum products and showcases the existing and future balance for POL trade across SAARC region. This in-house Study elaborates upon the need and rationale to steer the direction of the efforts to be undertaken by SEC in the next five years. It briefly discusses all such important areas of energy, as well as their usefulness to the people of SAARC. It is a strategic guideline for the future working of SEC. This fifth annual issue of SAARC Energy Data Book has been compiled for SEC by Dr. Sahibzada Ali Mahmood from Pakistan. The book provides statistics on different sources of energy in SAARC Region as a whole, as well as of individual member states for the years, 2006 to 2016. The book contains important data on various aspects of energy in SAARC for regional and international professionals, researchers and planners. The book is available free of cost through SEC website and SAARC Secretariat official documents portal. The Sixth Edition of SLBC was organized on 16-18 March in Kathmandu, Nepal by SAARC Chamber of Commerce and Industry (SCCI) in collaboration with the Federation of Nepalese Chambers of Commerce & Industry (FNCCI) and Friedrich Naumann Foundation (FNF) and with the support of Government of Nepal, under the theme “Unleashing Shared Prosperity through Economic Integration”. The Conclave hosted business delegates and high-level government officials, including Ministers from the Member States of SAARC. The Regional Convention and Workshop provided a good opportunity for fruitful discussions on means and ways to address the issue, concerning Child Marriage and Child Sexual Abuse and Exploitation and made valuable recommendations. supported by the National Child Protection Authority and NACG, Sri Lanka. Coinciding with the SAFA meetings, SAFA-World Bank FRED Conference was hosted by the Institute of Chartered Accountants of Pakistan (ICAP) and the Institute of Cost and Management Accountants of Pakistan (ICMAP) on 23-24 September 2018 at Hotel Marriott, Karachi, Pakistan. Coinciding with the SAFA meetings, the Institute of Cost and Management Accountants of Bangladesh (ICMA Bangladesh) hosted the SAFA International CFO Conference under the themes “The Future of Finance: Digitize, Drive and Transform” on December 8, 2018 at Hotel Intercontinental, Dhaka, Bangladesh. The Conference brought together eminent speakers from the manufacturing community, technology experts & innovation specialists to share their experiences and views on sustainability of startups and focus on emerging developments in the MSME sector with a special reference to women entrepreneurship. Government of India allocated five acres of land in Visakhapatnam for establishing women entrepreneurship International Trade & Technology Hub. Ophthalmologists and experts involved in eye health from different Member States discussed challenges pertaining to eye health. The theme of the Conference was “From Darkness to Light”. Organized by SAO (a Recognized Body of SAARC) with Nepal Ophthalmic Society. International Women Entrepreneurs’ Summit-2018: “Equality begins with Economic Empowerment”. This annual summit aimed at addressing challenges associated with gender parity in the economic sphere and advancement of gender responsive trade facilitation policies. The event was attended by delegates from over 27 countries representing women leaders and professionals from various sectors. "Delivering Innovative Business Strategies: The Quest for Managerial Excellence"
The Association of Management and Development Institutions in South Asia (AMDISA), a SAARC Recognised Body organized the event through networking with its Members within the SAARC Region and encouraging participation in this program, which was attended by the leading academicians and Deans and Directors of Management Schools from the SAARC Member Countries. Alongside this event, AMDISA’s 74th Executive Board Meeting was held on 4th September 2018. The Conference elected an Executive Board. Further, the Conference passed a resolution to work together with SAARC bodies in the areas of mutual interest. FAPSS participated in both the IAPS inaugural functions held during the CME program and the main inauguration of the Conference on October 25th and 26th respectively. The IAPS Conference was also held on 25-28 October 2018 at Chandigarh with 375 delegates attending. FAPSS President, secretary and other members participated. Topic of event: “Strengthening SAARC Through Responsible Management Education: The Role of Accreditation”. Association of Management Development Institutions in South Asia (AMDISA) & its Member Institutions. Message of the Secretary General of SAARC was read in the meeting and was well received by the house. The Executive Committee Meeting of SAARC Surgical Care Society was attended by Presidents of All National Surgical Societies of Member States. All activities of the bodies are not included since their complete ‘Annual Progress Reports’ for 2018 are yet to be received.